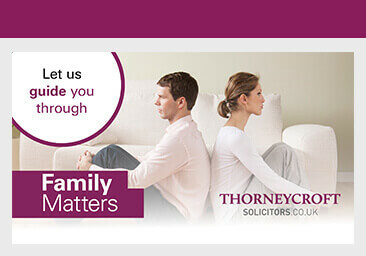 At Thorneycroft Solicitors we offer a range of divorce packages to suit your needs. Each is clearly priced, with no hidden charges and we even offer free first advice to ensure you choose the right service for you. Select from the 4 options below to see what is included in each, or alternatively give us call and we can chat through the best solution. What do you get? Not sure which option is right for you? Discuss your circumstances with us and get some initial advice, at no cost to you. What do you get? We advise you and complete all the legal paperwork and then guide you through the process from there. Is it right for me? You want some expert help completing the right forms but you're confident in dealing with the rest yourself with some guidance. What do you get? We do everything needed to obtain your divorce from start to finish, with on-going advice and support throughout provided in-person. Is it right for me? You want a lawyer to manage the whole process and don’t expect disputes over children or finances. You would like face-to-face advice. What do you get? The alternative to our fixed price services, simply pay for as much of our expert assistance as you require. Is it right for me? You expect disputes over children or finances. Real, local solicitor firms - not 'case managers' in central call centres. Tailored service for divorces including complex issues or finances. Help you with issues about your children and finances.